Lawyers for Fifa presidential candidate Prince Ali bin al-Hussein say they have made an official request for Friday's election to be suspended. 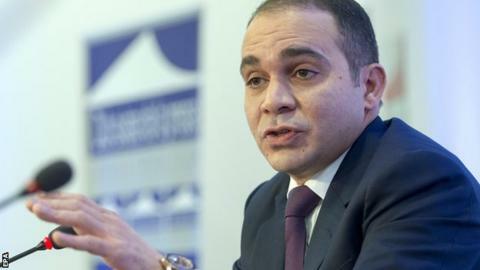 Prince Ali, 40, is unhappy with voting arrangements and has appealed to the Court of Arbitration for Sport (Cas). The Jordanian wants transparent voting booths to ensure the election is fair and open, but world football's election commission rejected the request. Cas says it will rule on Prince Ali's appeal by Thursday morning. Prince Ali is one of five contenders looking to succeed Swiss Sepp Blatter, who is stepping down after 18 years. Ali wants to ensure delegates do not photograph their ballot papers when they choose the next president. He believes transparent booths would prevent them from doing so and thus help delegates avoid coming under pressure to produce evidence of their vote to interested parties. However, Fifa rejected his proposal and will instead ask voters to leave their mobile phones outside while choosing between the five candidates. Prince Ali's lawyers want "a fair electoral process" and think Fifa's request for voters to leave their phones behind when they vote is "not sufficient". They claim Fifa's "behaviour" denies "any right to a fair and transparent voting process" and are now hoping Cas will back them.